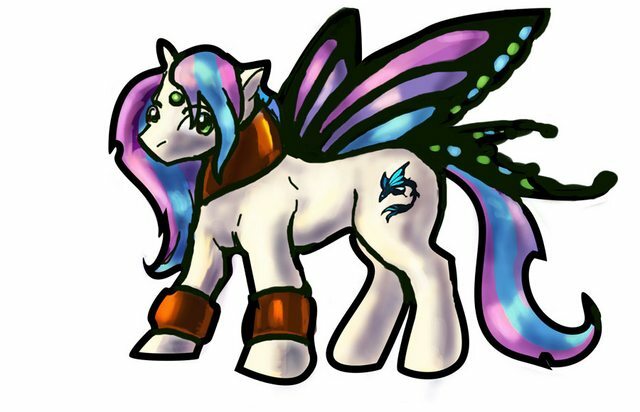 So, here we have Miss Volans, a Skimmer wing pony. Similar to the Windy/Summer/Glimmer wing ponies, Skimmer wings sport large butterfly wings that are mostly of the swallowtail type. Skimmers also feature a simple jewel in their forehead. wings are black with three stripes colored as the same as the hair; blue and green dots along the wing's edge. cutie mark is a black flying fish with blue details in the fins. She enjoys skimming along the ocean, and all things iridescent. I don't really enjoy making personas, they always tend to sound too sue-ish. But Here she is just the sake of having a bio page for her.